I’m no stranger to losing sleep over video games, though usually in a positive context, e.g. that the game is fun and I don’t notice the time. But what if I was to tell you the story of a video game that was literally designed to steal your ability to sleep… among other things? Sounds far-fetched, right? Read on, gentle reader. In 1981, Atari had created an extraordinarily innovative video game called Tempest. This game, originally imagined as a 3-D remaking of Space Invaders, had players pilot a spacecraft on the near end of a “tube” that extended into the distance on a display, using now-primitive but then new and innovative colour vector-based graphics (as opposed to raster-based graphics, the more traditional pixellated, hand-drawn art). Vector graphics weren’t new at the time, having been used for other games like Asteroids, but the addition of colour with Atari’s “Color Quadrascan” shadow mask technology, developed to compete with raster games, was a significant step forward. The game also featured differing playing boards at each level, with different geometric shapes making up the “tube”, rather than the usual incremental difficulty increases on an identical board that video games til then had used to ratchet up the pressure on players as games went on. And it even featured the ability to choose your starting level based on performance in a previous game, so veterans wouldn’t necessarily have to play through the initial levels over again while attempting to cause the game to roll the level or points counts over. This marked the first video game continue option — though a later raster game called Fantasy implemented it in its more traditional form. This post isn’t really about Tempest, though. I’m really just setting the stage for what the state of the art was in 1981. If you’ll believe the urban legends, the US government, at about that time, teamed up with a German developer named Sinneslöschen (loosely translated: “Sense Erase”) in an attempt to turn the nation’s Pac-Man Fever into something a little more useful for the empire: mind control. They created a video game that kids would become addicted to, would play at every opportunity, until the mind control would kick in and they’d lose the ability to sleep or even lose their memories. 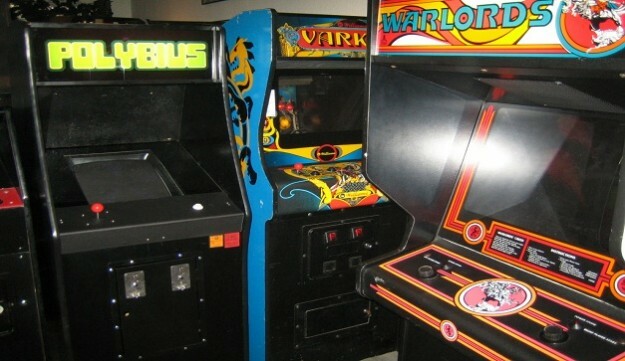 A post written anonymously and added to CoinOp.org in 1998 described a video game called Polybius, named after the Greek historian, which had appeared for a very short time in arcades in Portland, Oregon. It was wildly popular, a space shooter with puzzle elements. Children would line up to play it, would fight each other to get access to the machine. Frequently, men in black coats would “service” the machine — collecting some data of some sort from the machine about how it was played, but uncannily, never collecting any of the quarters the kids had fed it. Children began to get sick from using the machine. Some would complain of loss of memory, some would find it impossible to sleep, some would awake in the night screaming. Some would swear off video games altogether, or become anti-video-game crusaders. Then, about a month after the initial test run began, the machines all disappeared. The supposed title screen of Polybius, the game that eats your dreams. Later, the legend morphed and some folks claimed to have obtained a ROM image (a data-dump of the game code from the original system boards). The original image associated with this myth is obviously a raster game, not a vector one, and yet in 2005 a man named Stephen Roach appeared on web forums attempting to “dispel the myths” of the game and provide an alternate explanation for the media hype about it. In 2007, he gave an interview to Bitparade, which describes a game much like Tempest, with aliens in a “moon base” that attempted to slip past your ship to attack you from behind. It also explains that somehow, accidentally, the game had triggered an epileptic seizure in a 13-year-old boy, whose mother sued the company and won, causing it to fold and the five developers of the American-based development company to disband. It’s doubtful any of this actually happened. Since no news archives from Portland, Oregon in 1981 are apparently available online, and no records of any video game causing seizures in Portland, Oregon in 1981 exist on the internet (except, of course, basically every single skeptical article about the game), it’s difficult, if not impossible, to corroborate any of the statements made around this game, even the tamer ones. That didn’t stop a game developer from creating a “remake” in 2007 using Dark Basic, creating an “approximation” of what the game would have been like based on the descriptions in the urban legend. That game is available for free download here, as a Windows executable. It has a secret code you can input — 35-34-31-54-12-24-45-43 (“Polybius” on a Polybius square cipher, an encoding scheme invented by the philosopher), which gains you access to the game’s “higher functions” options, which include options like “somniloquy” and “hypnopompic recall”. The game also includes a number of extremely brief subliminal messages evidently ripped from the movie They Live, including “reward indifference”, “conform” and “no ideas”, as well as scary faces that fly at you and make you think you’re seeing things, or out-of-place noises, or autonomous suggestions like “don’t you want to play?” and giving you free credits to entice you to try your hand. For those of you who would prefer to see stills of the game, here’s some. None of these effects were remotely doable using the technology of the time, remembering that color vectors were only possible through some very specific technology that Atari had, and they weren’t nearly as advanced as what you see in this game. So, the game probably never existed, some people likely tried to take credit for the myth and insert themselves into it by “debunking” the more unrealistic parts of it in an effort to suggest that game anthologies could include their game idea (and thus hijack a myth in an effort to manipulate it into becoming a sort of reality), and a fan of the legend created a game that couldn’t possibly cause gamers to line up in droves to play it, judging by some of the more nausea-inducing visual effects (I’ll admit, watching the video gave me a bit of a headache and a queasy stomach, if that’s any anecdata). The legend of Polybius is so entrenched into video game history that it’s since turned up in the video-game-fanservice movie Wreck-It Ralph, an episode of The Simpsons, and numerous game collectors and myth buffs have created reproductions of the supposed cabinet passed off as real — incidentally, they seem to heavily reference the design of a Galaga coin-op cabinet. A more interesting aspect of this myth is the fact that there are, in fact, Russian coin-ops from 1985 containing bootlegs and knock-offs of five popular games, called the Poly Play. About a thousand were made, and they are extraordinarily rare today. And there’s a lot of talk of a preliminary beta version of Tempest, called Vortex, flying around about the same time frame as when Tempest was actually released, which could easily have been a buggy version of the soon-to-be-released Tempest. Additionally, there’s a plausible origin for the “game of doom” trope from this time frame — in 1981, an Asteroids world record attempt was made in Portland, Oregon, but was derailed by the kid becoming sick to his stomach after 28 hours. And in 1981 and 1982, two very young players met their doom shortly after racking up high scores in a game called Berzerk, dying of heart attacks at the ages of 19 and 18. In video game lore, their demise is attributed to the Big Bad of that game franchise: Evil Otto. I think perhaps I’ll tell you about him in my next post. Do yourself a favor and check out Tempest X on the PSX or PS2. I don’t know if their are any newer versions but OMG I still dust my disc off and play once in a while. It aged well. A classic remake of a classic. I’ll see what I can do. Probably can find it on eBay. Thanks! Huh! I’m totally unfamiliar with the Berserk tidbit of video game culture, that should be interesting to read about. I don’t think there’s any creepy urban legends surrounding it, but one of my favorite VG culture icons is Dopefish. That effect is called Moiré, an optical illusion, and as far as I know, it’s not an epileptic trigger, which requires lights to pulse at certain frequencies. Wow, that’s a lot from one little post, assuming there aren’t older Usenet / BBS stories. Sort of a Roswell, minus an original newspaper article. The eleventh episode of the Max Headroom TV series (Nov. 1987) was named “Whackets”. A special signal in the broadcast addicted people to the show containing it (e.g. a building is collapsing and people are running in to rescue their TVs). The episode is notable for Bill Maher’s performance as host of the game show people are addicted to. The question I have is, was the TV show based on the urban legend, was the urban legend based on the TV show, or are the two unrelated? Aah, Dopefish! That’s a really fun bit of trivia deserving of its own post eventually! I don’t know if the Max Headroom episode predated the urban legend, but it’s very possible, since the first recorded instance of the Polybius myth is 1998. The idea of mind-control in “the signal” is much older though — probably as far back as the first use of radio. They’re called “holes” in the service manual. I have one out in the shed. I used to stay up all night playing Silent Service on slow. That’s why I no longer have any gaing system. Was Silent Service the NES game where you are a submarine captain and have to find and destroy enemy ships/fleets? I loved that game. Sure was Chris, you could play for hours without getting a chance to fire a single shot.